‘What did you think of the film? !’ I’ve been asked often since Baz Luhrmann’s take on F. Scott Fitzgerald’s novel The Great Gatsby [http:// thegreatgatsby.warnerbros.com] has appeared in cinemas. Purposely, I didn’t read any reviews. My Irish Husband Tony and I went to see it last weekend in 3D at the art deco Electric Cinema here in Birmingham, UK. And then I went back the next day to see it in 2D. I really liked it. Definitely better than the 1974 version starring Robert Redford, which looked gorgeous, but lacked a certain…chewy center. The Irish Husband really was impressed by the 3D, but I’m not so sure. The technique forces the director to put a lot of action in the foreground. Characters point a lot. When I saw the 2D version the next day, there were fewer distractions, which made it a lot easier to pay attention to the music, the performances, and the smaller touches that happened in the background. For one thing, I feel as tho Leonardo DiCaprio as Gatsby captured more of the depth of the character as Fitzgerald envisioned him. Early versions of the manuscript show that Fitzgerald had, in the estimation of his Scribner’s editor, Maxwell Perkins, 40, made Gatsby too vague. Revising the galleys, Scott added subtle touches suggested by Perkins that fleshed out the character, but still left him mysterious. DiCaprio gets this. Luhrmann’s version also gave more context to the story than just ‘everyone went to a lot of parties in the 1920s.’ I’m not sure why he felt the need to bookend the film with narrator Nick Carraway in a rehab centre, talking to a psychiatrist in 1929. Remember that Fitzgerald, then 26, began writing the novel in 1922, the year in which it is set. He had had a huge success with This Side of Paradise , the first of many truly modern American debut novels that Perkins would acquire for Scribner’s, and the follow up The Beautiful and Damned . His flapper heroines, somewhat based on his wife, Zelda, then 22, also flitted through the short stories he wrote for the Saturday Evening Post and other popular magazines of the time. Perkins published collections of these stories after each novel came out, figuring that the sales of one helped the other. By 1922, Scott and Zelda had only been to Europe once, and hadn’t liked it very much. Living in Long Island from October of that year, Fitzgerald keenly observed his partying neighbours, including many members of the Algonquin Round Table and others working in the budding film industry. After hooking up with other American ex-patriates in Paris, particularly the golden couple, Gerald and Sara Murphy, they all moved on to the Riviera in the spring of 1924 where Fitzgerald continued to work on Gatsby by sending manuscripts back to Scribner’s by post and responses to Perkins’s suggestions by telegram. No internet then. Zelda had an affair that summer, with a French aviator no less, which must have fed into Scott’s bittersweet depiction of Gatsby’s golden girl, Daisy. In the film, Nick Carraway is shown unpacking a first edition of James Joyce’s Ulysses in its original blue cover. Altho Ulysses was published in Paris in February of 1922, copies weren’t readily available in the US yet. Fitzgerald knew of Joyce’s work, however, from the instalments which had appeared in The Little Review before they were censored by court order. With the benefit of history’s hindsight, we can appreciate the Hitler-like moustache Luhrmann puts on Tom Buchanan’s upper lip, but Fitzgerald’s hint of fascism in his novel’s villain reflects his own perception of the undercurrents of 1920s global politics. So Fitzgerald was not looking back at a time before the stock market crashed and the world went to war again. He was capturing a time after the world had been to war and was dancing towards a cliff. Did he see it coming? We can. This dark side to the frothy twenties is what comes through in Luhrmann’s film, and particularly [much to my surprise, I admit] in the music by JayZ and others. Wondering why Luhrmann would make this choice—a ploy to get the young ‘uns in?—I read an interview in which the director said he wanted the audience to have the experience of those in the 1920s who were hearing jazz for the first time. And it works. ‘…When I’m no longer young…’ is still going through my head. While the party sequences are giddy and gorgeous, the music adds substance as well as foreboding. But why wasn’t dance used more? Whenever a group of partygoers breaks into synchronized movements, the camera quickly moves on. This struck me as a missed opportunity to communicate even more of the energy of this destructive lifestyle. And why leave out one of Gatsby’s best descriptions of Daisy, ‘Her voice is full of money’? 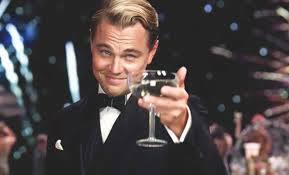 Which brings us to the center of the film and the book, Gatsby himself. Redford certainly looked the part, but his Gatsby was strangely mechanical. All style, no substance. For me, DiCaprio captures the passion of Fitzgerald’s enigmatic character, as well as the stalker element of his personality. Does his obsession really have anything to do with Daisy herself [well played by Carey Mulligan]? Or does he only desire the green light at the end of the dock? In the scene where Gatsby lashes out at Tom Buchanan [The 3D works well in that instance], you can feel his anger and jealousy. But is that his motivation? Getting back at Tom, rather than having a lasting relationship with Daisy? My recommendation: Thumbs up. But no need to shell out extra for the 3D. Read the book instead. Using only a pen on lined yellow paper, Fitzgerald was able to tell a 3D story with 3D characters. Even in the 2D film version, they leap off the screen.